Sometimes in a period of dryness – when gestures of love have become habitual and shaming – something happens to arouse the sleeping heart, to soften and bring moisture to one’s sensibilities. This little dog appeared at dusk on a frigid evening, collarless and unidendifiable by any means. He may have sought his liberation or been abandoned, yet now he shivered from the cold and craved attachment. 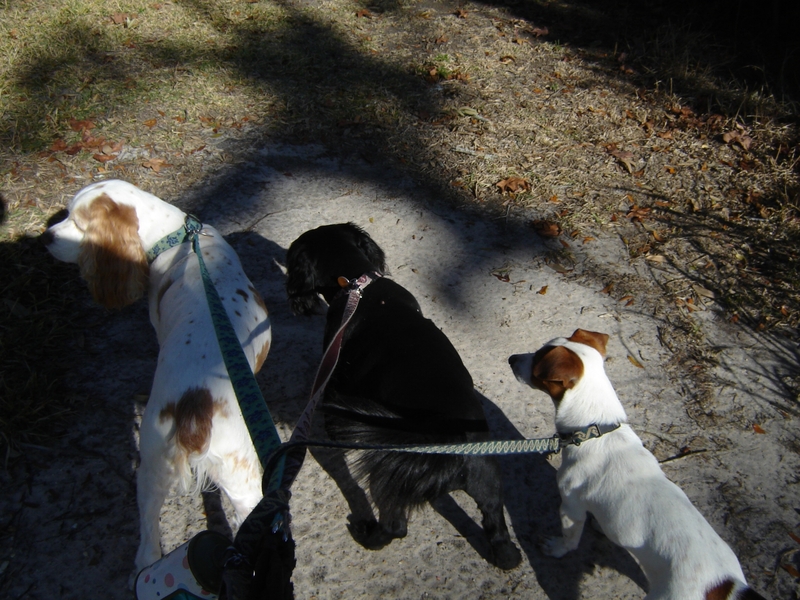 My own dogs shivered in excitement, lunging forward – mouths agape and tails-a-wagging. The small one skittered in alarm, retreating as I coaxed the reluctant Music and Star into the car. 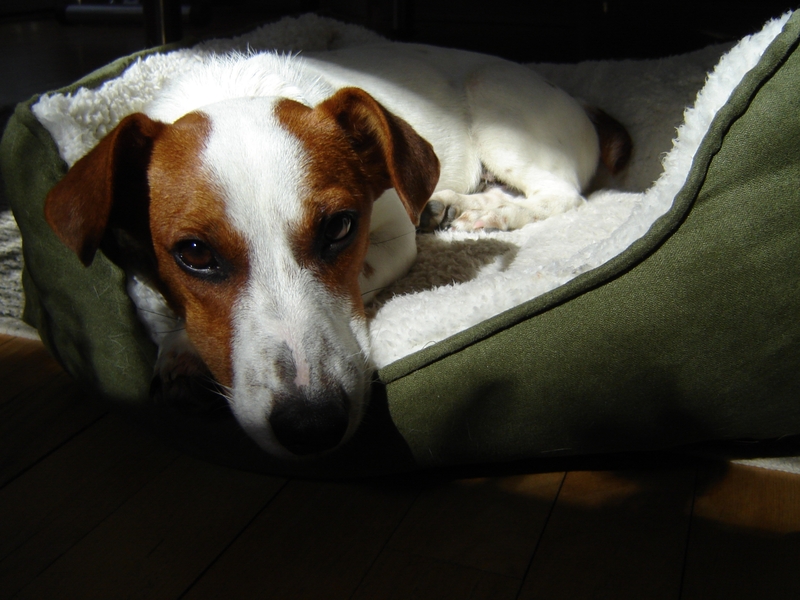 Now the young Jack Russell Terrier came into my waiting hands, surrendering gratefully against my body. He breathed a sigh and so did I; the stress of both our days was instantly replaced by calm. It felt like calm. It felt like coming home. But even as my eyes were wet with tears of recognition, the rational me drove to Bienville Animal Medical Center. The rational me observed as the kind attendants scanned the lost dog for a microchip and telephoned possible owners. The rational me let them take him from my clinging hands. I felt bereft without him, and over the next few days I called repeatedly to see how he was and if someone had claimed him. By the weekend no one had and he wasn’t eating well. I was told that on Monday he would be moved to the shelter. I brought him home on a weekend when I had numerous holiday obligations. Love isn’t rational, and by this time it was love that moved me. Love made me foolish and brave. It made me take on that which others warned me to think twice about. I wasn’t ready to think twice; I was alive with youthful energy. Abandoning the limitations of my age I vowed to manage the complexities of loving three dogs and a feisty cat – with grace. I quickly discovered that the little dog loved the small green bed that the cat had rejected. To him the bed meant settle down, so the bed went upstairs, downstairs, and into the back of the car. This gave me respite now and then, but I also discovered he had never been on a leash. A leash brought on darts and dashes and dramatic flips in the air. I let him run along beside the other dogs – at least for the moment. Their were moments when our time together was idyllic, when I was sure all things were possible. The puppy seemed to learn the patterns and rituals of the older dogs. He learned that the small blue bowl was his – that venturing toward the large green bowl or the large red bowl brought a NO from the one who provided the food, and nervous growls from other members of his pack. The little dog loved to play: to run and pounce on toys that were tossed and to spar with Star in a circling, prancing dance that made me laugh in delight. I loved to lean back in my chair at night to watch a movie, the little dog curled in sweet surrender upon my chest. The other dogs stood guard on the porch against night-time marauders. All was well. On Sunday a friend whose old dog had recently died came by to visit, and her instant rapport with the calmer than usual Jack Russell Terrier gave me hope that a good home would be provided, and I wouldn’t be spending the rest of my days being super mom to three dogs and an increasingly prickly cat. I was becoming a little ragged. She told me she needed twenty-four hours to decide. That afternoon I left the dogs for several hours to make Christmas wreaths with my siblings for the cemetary, and after that a family party. On returning, I found three nervous and clamoring dogs and several “accidents” in my studio. By Tuesday morning, I was having a meltdown – and praying desparately for HELP. I was due to go Christmas shopping with my sister, while the dogs were all going to doggy daycare at the vets. Bobby was getting his shots. Music and Star were settled first, then I brought in the little dog, walking beautifully on his leash. Exclamations met his appearance; a woman with two puppies and two children were sitting with an older man in overalls – a wooden cross on his ample chest. At their response, I blurted out the story of finding the beautiful little creature running loose with no leash and being unable to locate owners or find him a home. The woman simply turned to the man and said “Take him, Richard.” Richard was slower to surrender to this sudden appeal to his manly heart, yet soon the little dog was pressed against that same heart, his chin was receiving a doggie kiss with pleasure. I lingered there, discussing this and that, but it was clear that this was the answer I had been praying for. So I hugged the large and tenderhearted man and was hugged in turn; we were in agreement. As Christmas approaches, and around me the world is a maddening rush of preparation, I find myself clinging to the possibility of stillness. I want to rest in the fact of my own existence. I want to save myself from the clamor of holiday expectation. I pray for the truth to claim me and for the holy child within me to dream new dreams. Yesterday, while in the throes of inner turmoil, I came across this photograph of my mother and myself. I had thought it lost, and now, just looking at it calmed, soothed, and brought me closer to myself. It was taken in 1986 in my father’s cottage by a photographer friend. CoCo had often taken photos of me dancing, but this was a shot she had long envisioned. We were posed on the window seat beneath the windows that had provided North light for my artist father, and the light was certainly instrumental to the achievement of a truthful portrait. I was allowed to rest within the guiding power of my mother’s hands. Grounded by her faith-filled love, I realized freedom in my life and through my dance. She blessed my creativity and found release herself through my wild leapings and cavortings. One of my favorite memories of my mother is of her sitting front row center while I performed. 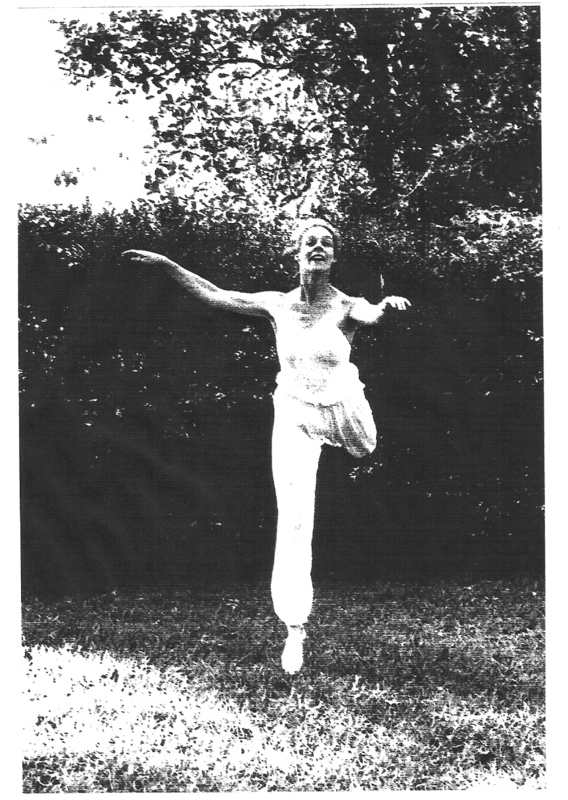 Her hands, which – even in stillness – spoke of grace, would seem to reflect her dancing daughter’s flight. Long fingers stretched, fluttered, and flew before her motherly breast, while her face assumed a rapture that gave meaning to the daughter’s efforts to soar free. Repeatedly, I did soar free in response to my mother’s love and affirmation. For moments the soaring abandon achieved through dance was all I knew and all I cared about. And it was worth the inevitable descent, at least as long as my mother was there to ease my fall. If I was away, the telephone calls could be long and rather torturous. Poor Mama’s patience must have been tested. Things were easier when I was living close to home. Face to face – hot mugs of milky tea to hand, and butter cookies melting sweetly on my tongue – old dances were quickly blessed and put to rest, dreams of future dances resurrected and discussed. 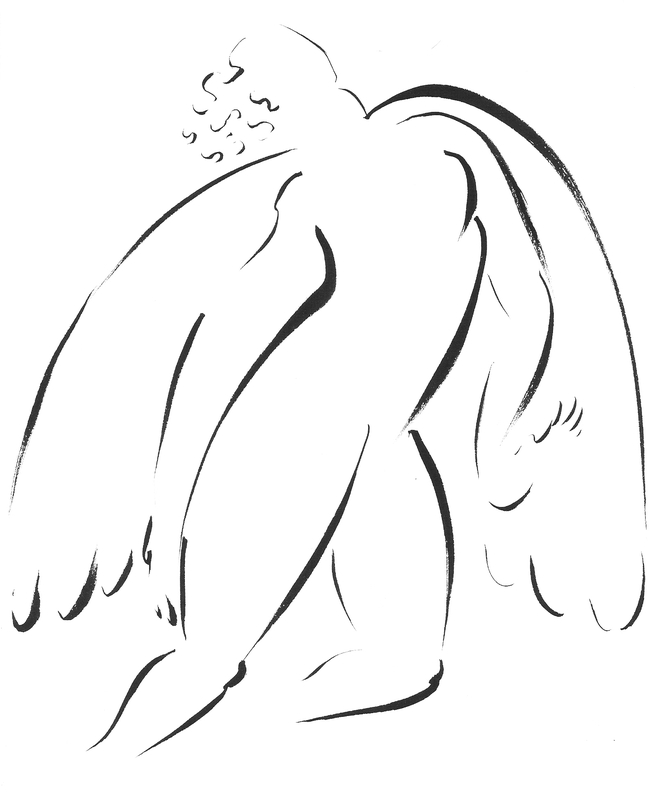 I have been drawing angels. After months of wrestling winged beings out of wire, I assembled a stack of cotton-based typing paper and went to my drawing table with brush in hand and angels on my mind. It had been some time and the weight of the ink-dipped brush was unfamiliar. My initial strokes barely marked the page at first, then the line was too heavy – too glaring a black to evoke a spiritual being. In the beginning was the wing. Wing followed wing onto the waiting page. In the air around my seated form the angelic voice of Susan Boyle provided a rhythmic accompaniment, and my hand danced the dance that my body was too still to dance. I prayed as I drew and the pages gathered in drifts upon the floor. Susan’s song had slipped into silence by the time the angel I sought flowed forth from my brush. As I gazed at the effortless lines, I gave thanks for the gift, then woke to the ache of my protesting knees and thought about lunch. Later in the day, I sifted through the discarded pages and found a few that came close to pleasing my more relaxed perceptions. 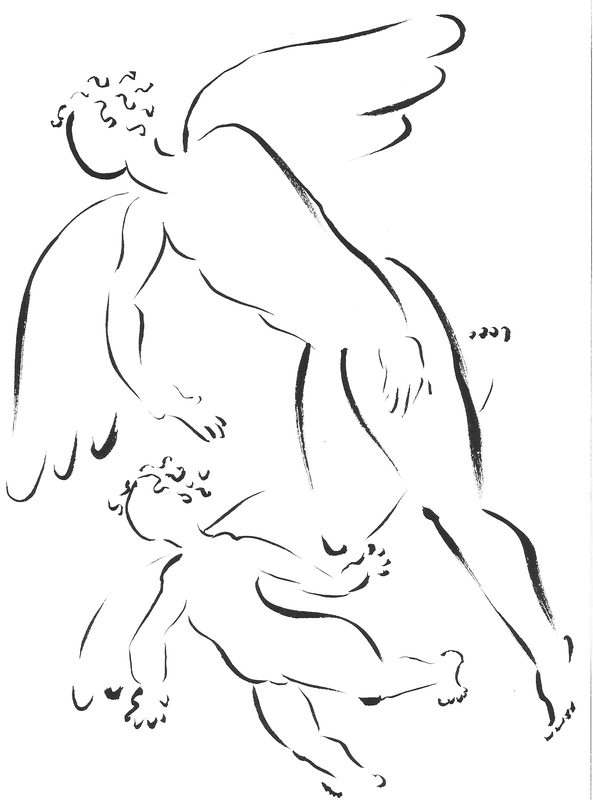 On several, the angel was joined by a child, and she appeared to be teaching, guiding, or protecting the child. The angel seemed less other-worldly than my first choice; there was something almost human about the connection between the two, and something mysterious about my own participation in this dance. 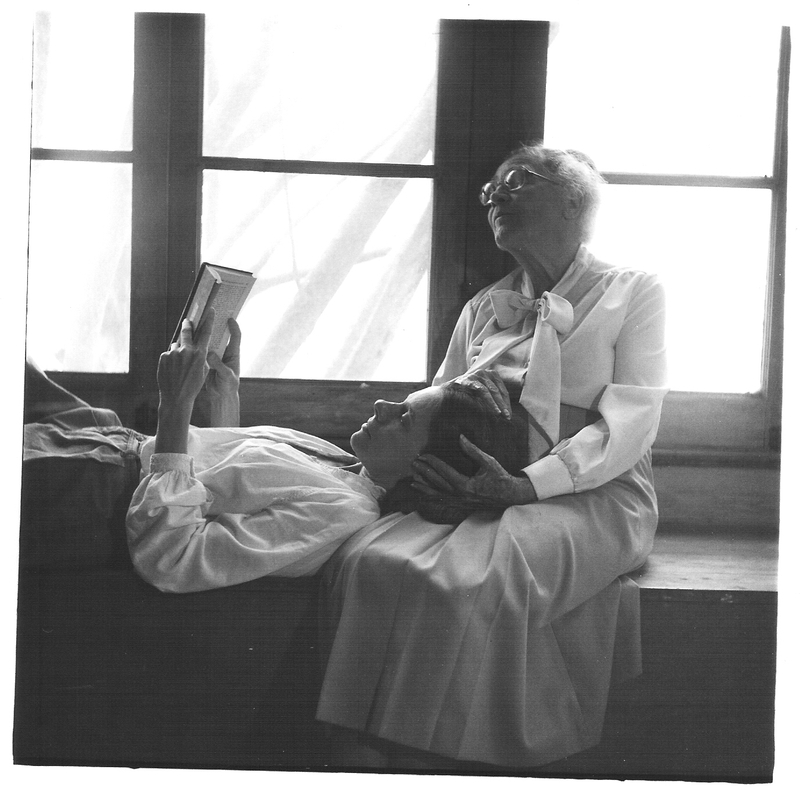 I find myself thinking of my mother – and the dance we danced in one another’s company for nearly fiftly years. I sometimes think that my mother was an essential ingredient in my life as a dancer. When she died, some part of me died with her. I felt lost upon the huge stage that we had envisioned together. When I danced it seemed that I danced with half of a heart, and that half was far too fragile to brave the world I had dreamed of braving. As often as not, when I faced my daily practice, tears flowed on the breath that should have brought movement. With my mama gone, where was the dancer? Oh, I still danced. With an audience present, the dancer came forth like magic and pleased the expectant ones. The teacher, too, inspired and guided the ones who still felt the effect of an earlier momentum. She carried on for several years, until menopause made pretending nearly impossible. Teachers should never weep in front of their students, nor should they reveal their vulnerability to those who stay after class wanting more. Needless to say, I couldn’t carry on forever with half a heart and that half broken and childishly seeking comfort in all the wrong places. It was time to withdraw and remember who I was. For days I have felt the desire to write this blog. My desire is a soulful desire – abiding as my body yields to flu-like symptoms. Fever, aches and pains, and debilitating congestion have put me on hold, forced me to wait and test the desire. Would it survive frustration? Would it eventually break through the muddled mind and body into clarity? Could I find words to express the very state that had been forced upon me? Even before the illness – as the holiday season and all it entails began to encroach upon my modicum of peace – I began to contemplate one word and how it might make possible a different approach to the coming weeks. The word is abiding, and when I began to stress over the usual seasonal demands, it came to me and hovered in my mind. The word appeared to be a promise and I took it into my heart and made it my prayer. Not so long ago I wrote a blog called “Companionship” about two ducks who abide in the Inner Harbor Park. Though I have moved beyond the blog, they are still with me – perhaps a symbol for the state I seek. Over the last few months I have done many sculptures of angels – for shows, to display in the Realizations Shop, even filled orders. It is good to know that the work of one’s hands is pleasing to others, and the work itself is satisfying and grounding. The sculpture in the photo above is something else: a gradual creation that came about in the lull between the other more purposeful making. First, one little duck surprised my hands. Then it sat alone on my bookshelf – barely visible unless the sunlight touched it briefly and in passing. A few weeks later – in an idle moment – I made for him a companion – slightly smaller: a gentle mate to join him on the shelf. It was some time before I wrestled the wire into a tree-like structure, and even longer before the leaves appeared, inspired by the star-like foliage of the sweet gum trees. I watched as they did their autumn dance, releasing gold and crimson leaves to brighten the path I took each day. 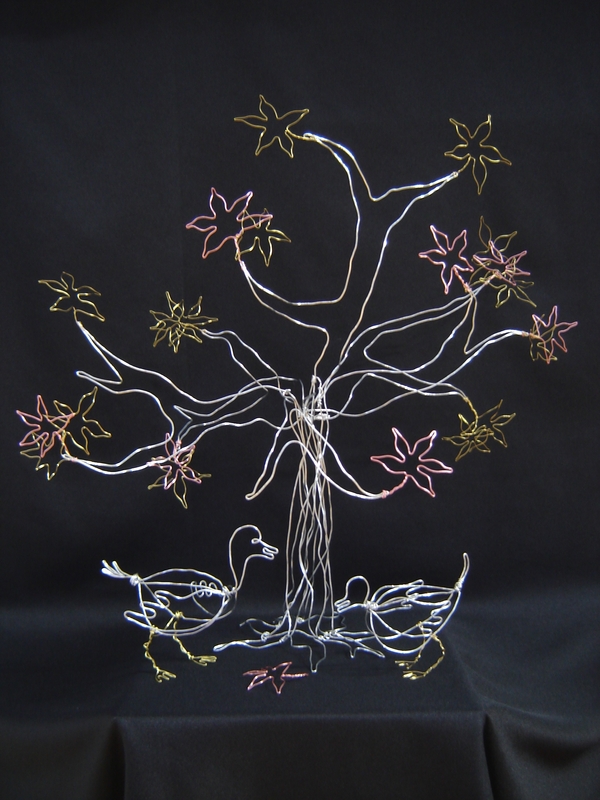 Then I formed the tiny imperfect ornaments for the tree beneath which my dear little ducks might abide. No… It is not the real thing, yet it is a modest tribute to the living creatures who inspire me: a work in progress like the state that I aspire to – an icon to inspire “abiding”. You are currently browsing the A Dance of Balance blog archives for December, 2010.